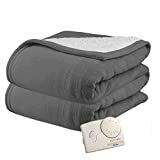 MaxKare Large Luxury Electric Heated Blanket Twin Size provides optimum coverage for the whole body and warms you with soothing heat, whether at home or in office. 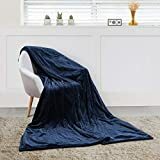 Embrace yourself in the electric blanket, which will help successfully combat the chilly cold in winter, keeping you relaxed in daily life and efficient in work. Convey your care and love for your family and friends with this blanket, warming their body as well as their heart. https://heaterheater.com/wp-content/uploads/2018/11/Twice-The-Heat-at-Half-The-Cost.png 0 0 HeatMizer https://heaterheater.com/wp-content/uploads/2018/11/Twice-The-Heat-at-Half-The-Cost.png HeatMizer2019-02-18 03:55:572019-02-18 03:55:57MaxKare Large Heated Blanket Twin Size with Adjustable Timer and 3 Heating Levels, Electric Heated Blanket with Auto-Off Feature and Machine-Washable Fabrics for Full Body Comfort 62" x 84"
SIMPLE COMFORT ELECTRIC HEATED BLANKET - We've designed an electric heated blanket to not only warm you, but also bring a level of luxury to your bed without too much bulk. NEW FOR 2018 HIGH TEC DIGITAL CONTROLLER - We've added the newest and most reliable technology to our blanket. 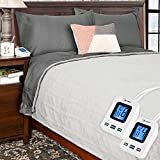 The Lighted Digital Controller is designed to sit on your nightstand so you can conveniently make adjustments without having to get out of bed. An extra-long 13' cord attaches to a heavy-duty plug at the foot of the bed. 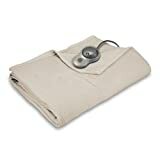 SAFETY - The patent pending ETL tested and approved SENSOR-SAFE technology insures your blanket will operate at the optimal level and efficiency while not allowing the blanket to overheat, giving you and your family safety and peace of mind. PRE-HEAT FEATURE - So you never climb into a cold bed ever again. 9-HEAT SETTINGS - So you can customize to exactly what you want. A built-in TIMER feature allows you to turn the blanket off when YOU decide. AUTOMATIC SHUT OFF - After 12 hours in case you forget. EVEN HEAT - Our unique construction process has the warming strands running thru 1-inch channels that are sewn between the layers (This is a 2-layer blanket) to keep even continuity and total coverage from head to toasty toes. The benefit to you is soothing consistent heat with no hot or cold spots across the whole blanket. CARE AND WARRANTY - Conveniently machine wash gentle, tumble dry on low setting. This blanket has a 5-year warranty. SIZE - King size blanket measures 100 x 90-inches and is split into 2-individual zones. Includes 2-controllers for a personal programmable level of comfort.